I took a deeper look as I was standing at the carousel waiting for my luggage. It's true what I heard, the handles of the bags are pointed onwards. Not just some, but really, all of them. 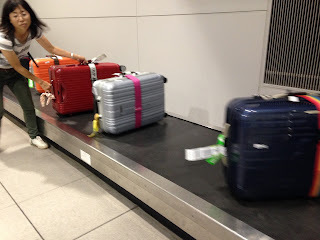 I confirmed as I looked at the bags that came out and went along the conveyor belt. Another classic example of Japanese thoughtfulness. You don't really notice because it's such a small thing. But when you take a moment to observe, you start to appreciate it. Just like many other things in life. Small, but makes a difference.